Mystere by Cirque du Soleil Las Vegas has the distinction of being the first Cirque du Soleil show to be performed on the Strip. This 90-minute extravaganza of frolic and fun has pleased audiences of all ages for over twenty years. Mystere is performing at the Treasure Island Hotel and Casino within the Mystere Theater. Mystere has been voted the best production show eight different times fending off other shows challenging its greatness. This stage show of fantastic comedy, stunts and tricks brings the big top to the world in a one-of-a-kind celebration. Mystere is directed by non-other than Franco Dragon who brings to the stage everyday aspects of the circle of life. Each segment of the show, whether a stunning feat of strength or pole jumping is full of energy and excitement as the artists perform each death defying stunt with precise accuracy. Mystere is a true delight that gives the audience a circus type atmosphere intertwined with circus style acts on stage. The show opens with a funny clown playing jokes on the crowd as they enter the theater. Once the show begins, patrons are enthralled by a variety of circus-style acts that perform on the stage. The Tissu performance is an intriguing combination of grace and illusion as the artist contorts and twists her body in a mystical way. Another portion of the show includes a fascinating Chinese pole routine that highlights the agility and strength of the performers as they leap from pole to pole. The pole artists wear two masks that give them the ability to never take their eyes off the audience. Guests are amazed as the forty plus entertainers assault the four silver poles. One other segment illustrates the strength of two men as they help each other to levitate, twist and contort their bodies while the two artists stand on a rotating sphere. The gymnastic feats accomplished with the help of a teeterboard can only be described as breath taking. The trapeze artists rely on death defying summersaults, mid-air catches and incredible strength to complete their performance. Utilizing over twenty-two miles of bungee cord the teeterboard acrobats perform summersaults and twists as they are flung into the air from this typical circus-style prop. There are aerialist artists that are attached to over seven miles of wire during their performance as they fly through the air completing incredible gymnastic maneuvers. As the show closes and the stage is filled with Japanese Taiko drums that beat wildly in an enthusiastic tribal way that brings the audience to their feet for the final time for the evening. Every aspect of Mystere is unique from the mysterious makeup on the entertainers to the intricate designs on the hand painted stage. The choreography is absolutely phenomenal during Mystere. The wardrobe is over 1,500 pieces with each of the eighty performers having three dress changes during the show and you can add another 1,500 pair of shoes to that number. The soundtrack during Mystere is performed by a live band. The music is a mixture of many genres from soul to rock to medieval that enhances the spontaneity of the incredible leaps and bounds by the artists. Everything falls into the right place from storyline to costumes to performers during this entertaining big top experience. The Mystere Theater at Treasure Island Hotel and Casino was the first theater built specifically for a Cirque du Soleil performance. The 1,600 plus seat auditorium has the perfect sight lines for guests to see all the magical artists on stage. With built-in props the stage functions as playground for the entertainers. 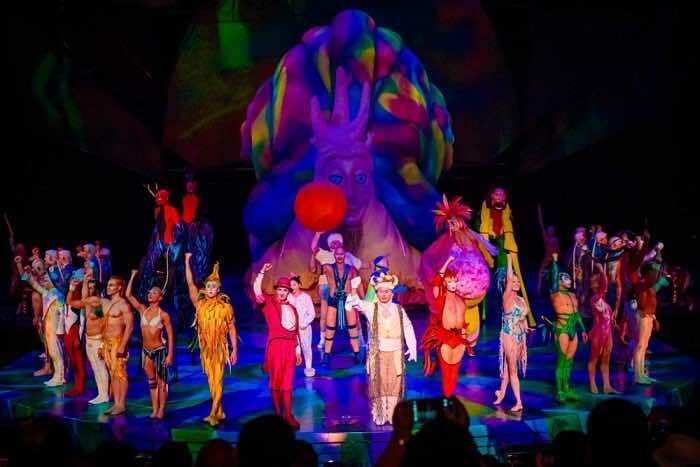 Mystere Theater is also outfitted with a state-of-the-art sound system and the multimedia effects that explode on stage enhance each performance. 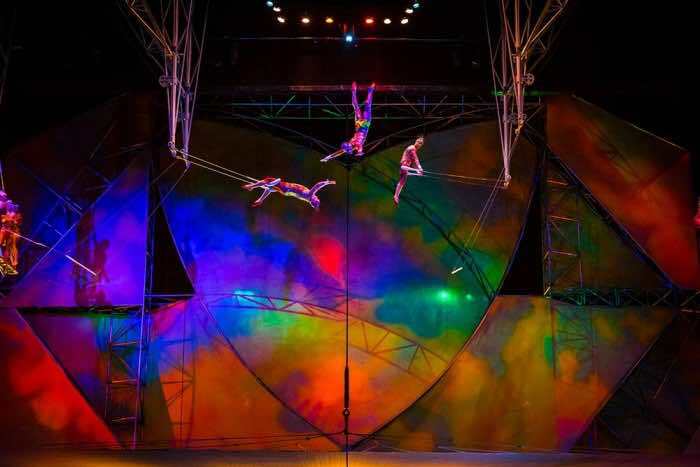 This incredible stage show of acrobatics, aerial artists, contortionists, dancers and men of strength is a must see for the Cirque du Soleil enthusiast to the novice Las Vegas show goer. 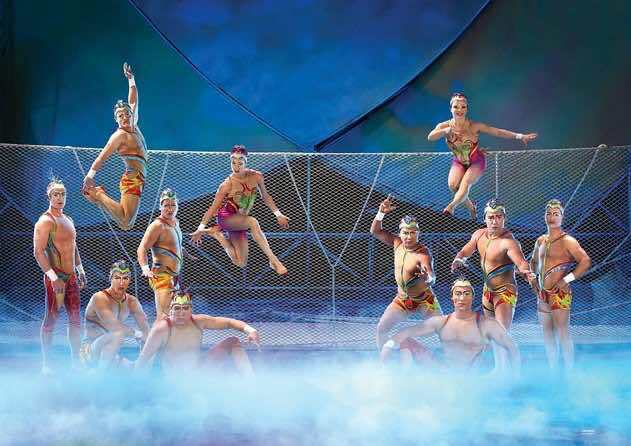 Mystere has over eighty talented performers in the cast who are from over twenty countries around the world. The show features such world class athletes as Ross Gibson from the British National Gymnastics team, Anna Zlatkova who is from Sofia, Bulgaria competed in the European and World Gymnastics Championships as well as Marek Haczkiewicz who is a trampoline expert that hails from Jawor, Poland. Mystere is directed by Franco Dragone and the set designer is Michael Crete. Debra Brown brings her expertise to the choreography and costume designer is Dominique Lemieux. The artistic director is Sandi Croft and the musical director is Rene Duprere. The show is performing at the Mystere Theater located within Treasure Island Hotel and Casino. This venue was constructed specifically for this Cirque du Soleil stage show. The 1,600 seat venue has a big top feel with great sightlines for the audience to enjoy the action. The sound and multimedia effects systems enhance the mystical aspects of the show. 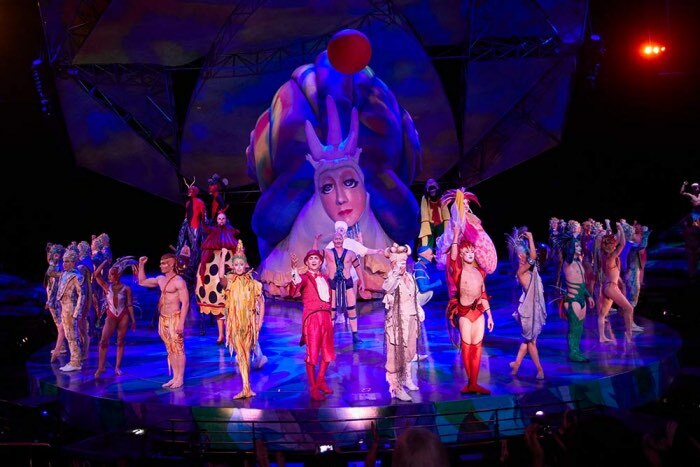 Mystere by Cirque du Soleil is open to all ages and has been a family oriented from the beginning. 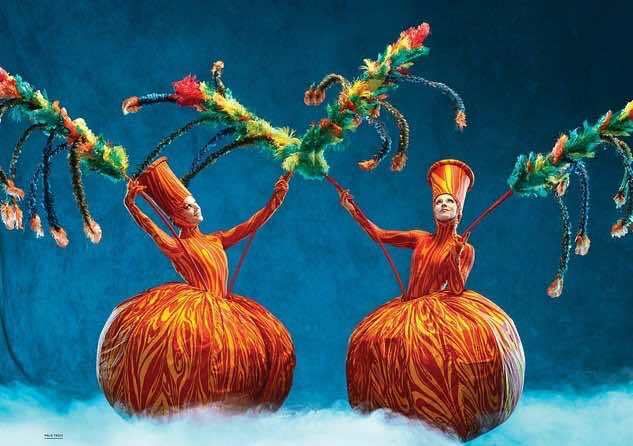 There are two performances Saturday through Wednesday at 7:00 and 9:30 P.M. Mystere Tickets are on sale now with the selection of balcony seats to a luxury Cirque du Soleil VIP adventure.